We've created a lab project called "Vacation Rental Tools" which is a Chrome browser extension that gives you extra functionality when working with listing sites. Read about it in our our Vacation Rental Tools Overview article and then read how to get it. This articles covers what kind of tools are available and how they work. At the moment, we've started it off with one tool as a proof of concept to see how well it is used and received by the community. We will be expanding on this and adding more tools very soon. The first tool in the toolbox is an export screen that allows TripAdvisor reviews to be exported in common Excel format including background data like the guest's location, avatar and owner response. You must be logged into TripAdvisor control panel (the vacation rentals portal) first. Then click this extension's "options" button and follow the prompts on the screen. If you are not logged into TripAdvisor, the tool will detect that and show that you are disconnected and provide a "Log In" button to the TripAdvisor login page. Just login to TripAdvisor as you normally do and then come back to the extension. 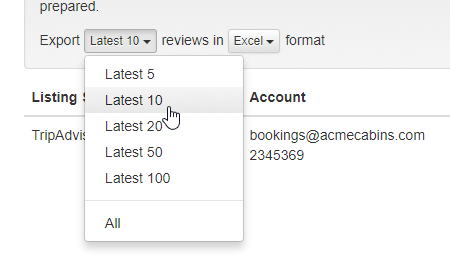 There is an option to select how many of the latest reviews you want to export from TripAdvisor. You can set that option to "All" but you should only do that the first time. On future exports, stick to the latest 5 or 10 so that you're not requesting 100s of reviews from TripAdvisor just to get the latest couple every time. There is also a drop-down for the format, but at the moment the only option there is Excel. We plan on adding CSV and TSV options in the future if requested. If a different format is important to you, please let us know. Click the Download Now button and the extension will start working. You'll see a message box pop up and the current status (ie. what the extension is working on) will be shown to you. When it's done, the browser will prompt you for a file location on your computer to store the completed Excel file. The layout of the Excel file is exactly the same as our Import Reviews from Excel spec. Give that support article a read - particularly the "Fill In the Excel Template" section - to see the columns and what they mean. If you're an OwnerRez user, because the layout is the same, this means you can move your TripAdvisor reviews into OwnerRez in two simple clicks: one click to export your reviews from TripAdvisor and a second click to import them into OwnerRez. No modifications, data entry or other work necessary in between! If you're not an OwnerRez user, you can use this Excel file to store your reviews offline or import them into a different software program. We've made the Excel layout open and comprehensive so that it gives you all your data in a vendor-agnostic format. More tools will be added soon. Please contact us if you have ideas for more tools.